So, I am actually quite a big fan of the Jupiter. 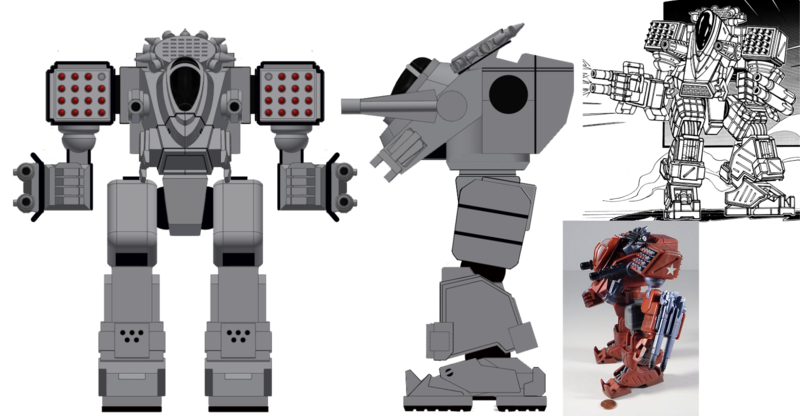 This 'Mech debuted in the original MechWarrior Dark Age set and and was probably one of the best to debut with the game. Pretty cool design, don't you think? It just oozes BattleTech with lots of big guns and missiles, and just gives off that excellent "Big Lumbering Tank" vibe without many of the strange and gangly aesthetics that plagued many early Dark Age designs (Blackhawk anyone?). Cockpit is too small, torso is too wide, the strange sensor dish (admittedly the weakest part of the dark age design) sits way too high and just looks awkward. The feet are too large while the arms are far too small. How are you supposed to use those hands with the gun barrels like that? 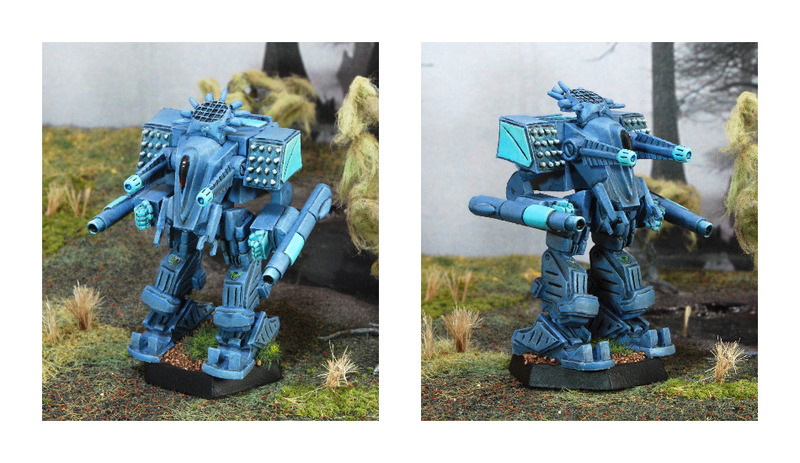 Quite obviously, the design has flaws compared to the original miniature. Beyond this, the casting on this miniature has had overall poor luck with thick mold lines. 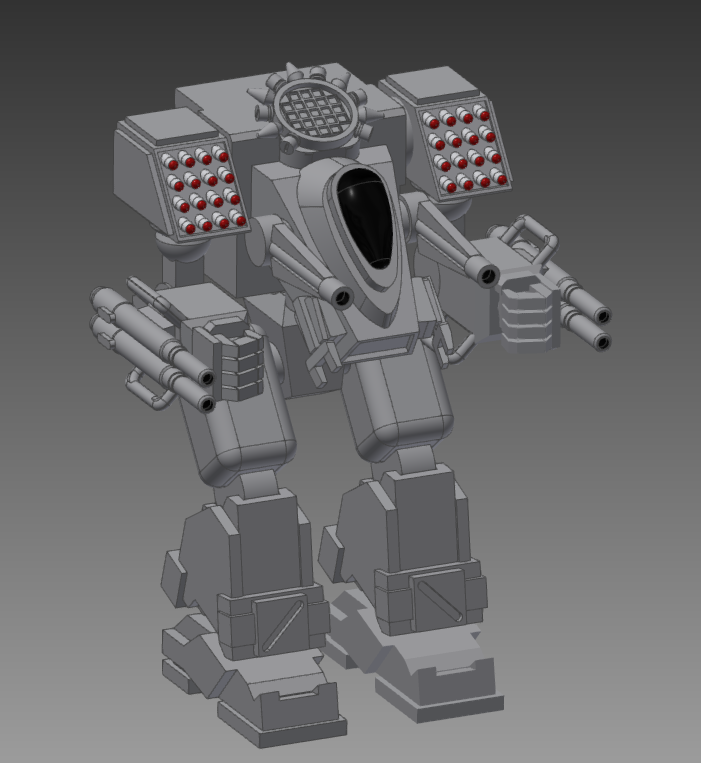 With that, I have taken it upon myself to do a basic 3D model (undetailed at this point) of the Jupiter to try and make a solid looking model that reflects the original design faithfully at the smaller BattleTech scale. Now, I fully realize that this is not a perfectly proportioned rough model, but that is how all of my miniatures start out. With the help my good friends, especially the very talented artist Justin "IAMCLANWOLF" "LKY13" Nelson I would hope to tune the design to make it perfect. And then, we could get it posted to the Ironwind Metals Fan Financing Initiative. Justin actually was able to do some rough work on the model to get me started, though I haven't had a chance to implement the suggested changes yet. This is typical of what I receive from him and it is incredibly helpful. I can obviously see many of his suggested edits will make this thing match the art and previous minis much better. I may not do everything he has suggested, but it always invokes a lot of thought and solid conversation, so every little bit is helpful. Some further back and forth is necessary, but it will go a long way to making this a really great design. Ironwind Metals is a small company. Very small. And let's face it everyone, BattleTech is not the most popular franchise. I have anecdotally been told that, compared to the 90s, a BattleTech miniature sells about 10x less miniatures that it would have 20 years ago. Now there are many factors for this that can be discussed ad nauseam for this decline, but the fact remains true: BattleTech doesn't sell all that great. As such, Ironwind is generous enough to do the Fan Financing initiative. It's sort of like a miniature kickstarter for miniatures. Each 'Mech costs approximately $800 to finance, but backers get every dollar they commit back in an Ironwind Metals gift voucher. This means that you get something for every dollar you commit, and if you were planning on making a purchase with Ironwind, you are literally out nothing. All fan financing is done through the Ironwind Metals section of the BattleTech official forums. Backers post in a forum thread when they are interested in backing a design, whatever that may be at any point in time. From there, a private message is sent to all backers with paypal information. After payment is received, Ironwind issues a gift voucher for the amount of the pledge. Then, a few months later, a brand new miniature is released, usually as an Ironwind Online Exclusive. Not a bad deal. I want to gauge interest in the resculpt of the Jupiter. Would people want this mini resculpted? Would you buy it? Let me know in the comments below or on my Facebook Page. If people are interested, I will finish the model 100% and have it miniature ready. From there, I will submit to Ironwind and see if they accept it as a future fan finance project. Finally, if it is approved, it will be posted to the above Fan Financing forum, and likely be produced! So, is a new Jupter worth the time or a waste of time? You decide.